Not to be confused with New Keynesian economics. Neo-Keynesian economics is a school of macroeconomic thought that was developed in the post-war period from the writings of John Maynard Keynes. A group of economists (notably John Hicks, Franco Modigliani and Paul Samuelson), attempted to interpret and formalize Keynes' writings and to synthesize it with the neo-classical models of economics. Their work has become known as the neo-classical synthesis and created the models that formed the core ideas of neo-Keynesian economics. These ideas dominated mainstream economics in the post-war period and formed the mainstream of macroeconomic thought in the 1950s, 1960s and 1970s. A series of developments occurred that shook neo-Keynesian theory in the 1970s as the advent of stagflation and the work of monetarists like Milton Friedman cast doubt on neo-Keynesian theories. The result would be a series of new ideas to bring tools to Keynesian analysis that would be capable of explaining the economic events of the 1970s. The next great wave of Keynesian thinking began with the attempt to give Keynesian macroeconomic reasoning a microeconomic basis. The new Keynesians helped create a "new neoclassical synthesis" that currently forms the mainstream of macroeconomic theory. Following the emergence of the new Keynesian school, neo-Keynesians have sometimes been referred to as Old-Keynesians. John Maynard Keynes provided the framework for synthesizing a host of economic ideas present between 1900 and 1940 and that synthesis bears his name, as is generally known as Keynesian economics. The first generation of Keynesians were focused on unifying the ideas into workable paradigms, combining them with ideas from classical economics and the writings of Alfred Marshall. These neo-Keynesians generally looked at labor contracts as sources of wage stickiness to generate equilibrium models of unemployment. Their efforts (known as the neo-classical synthesis) resulted in the development of the IS–LM model and other formalizations of Keynes' ideas. This intellectual program would produce eventually monetarism and other versions of Keynesian macroeconomics in the 1960s. After Keynes, Keynesian analysis was combined with neoclassical economics to produce what is generally termed "the neoclassical synthesis", which dominates mainstream macroeconomic thought. Though it was widely held that there was no strong automatic tendency to full employment, many believed that if government policy were used to ensure it, the economy would behave as classical or neoclassical theory predicted. In the post-World War II years, Keynes's policy ideas were widely accepted. For the first time, governments prepared good quality economic statistics on an ongoing basis and a theory that told them what to do. In this era of New Deal liberalism and social democracy, most western capitalist countries enjoyed low, stable unemployment and modest inflation. It was with John Hicks that Keynesian economics produced a clear model which policy-makers could use to attempt to understand and control economic activity. This model, the IS–LM model, is nearly as influential as Keynes' original analysis in determining actual policy and economics education. It relates aggregate demand and employment to three exogenous quantities, i.e. the amount of money in circulation, the government budget and the state of business expectations. This model was very popular with economists after World War II because it could be understood in terms of general equilibrium theory. This encouraged a much more static vision of macroeconomics than that described above. The second main part of a Keynesian policy-maker's theoretical apparatus was the Phillips curve. This curve, which was more of an empirical observation than a theory, indicated that increased employment and decreased unemployment implied increased inflation. Keynes had only predicted that falling unemployment would cause a higher price, not a higher inflation rate. 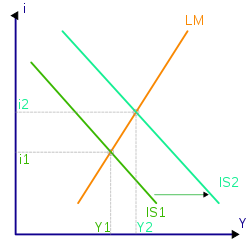 Thus the economist could use the IS–LM model to predict, for example, that an increase in the money supply would raise output and employment—and then use the Phillips curve to predict an increase in inflation. The strength of Keynesianism's influence can be seen by the wave of economists which began in the late 1940s with Milton Friedman. Instead of rejecting macro-measurements and macro-models of the economy, they embraced the techniques of treating the entire economy as having a supply and demand equilibrium, but unlike the Keynesians—they argued that "crowding out" effects would hobble or deprive fiscal policy of its positive effect. Instead, the focus should be on monetary policy, which was largely ignored by early Keynesians. The monetarist critique pushed Keynesians toward a more balanced view of monetary policy and inspired a wave of revisions to Keynesian theory. Through the 1950s, moderate degrees of government demand leading industrial development and use of fiscal and monetary counter-cyclical policies continued and reached a peak in the "go go" 1960s, where it seemed to many Keynesians that prosperity was now permanent. However, with the oil shock of 1973 and the economic problems of the 1970s, modern liberal economics began to fall out of favor. During this time, many economies experienced high and rising unemployment, coupled with high and rising inflation, contradicting the Phillips curve's prediction. This stagflation meant that both expansionary (anti-recession) and contractionary (anti-inflation) policies had to be applied simultaneously, a clear impossibility. This dilemma led to the rise of ideas based upon more classical analysis, including monetarism, supply-side economics and new classical economics. This produced a "policy bind" and the collapse of the Keynesian consensus on the economy. Through the 1980s, Keynesian macroeconomics fell out of fashion as a policy tool and as a field of study. Instead, it was felt that combining economics with behavioral science, game theory and monetary theory were more important areas of study. On the policy level, it was the era of Margaret Thatcher and Ronald Reagan, who advocated slashing the size of the government sector. However, beginning in the late 1980s economics began shifting back to a study of macro-economics and policy makers began to look for means of managing the global financial network, which was increasingly interlinked. In the 1990s, the "uncoupling" of money supply and inflation caused an increasing questioning of the original form of monetarism. The repeated failures of "big bang" marketization in the former Soviet Bloc have encouraged the recent revival in Keynesian ideas, with particular emphasis on giving the Keynesian macroeconomic analysis theoretically sound foundations in microeconomics. These theories have been called new Keynesian economics. The heart of the new Keynesian view rests on microeconomic models that indicate that nominal wages and prices are "sticky", i.e. do not change easily or quickly with changes in supply and demand, so that quantity adjustment prevails. According to economist Paul Krugman, this "works beautifully in practice but very badly in theory". This integration is further spurred by work of other economists which questions rational decision-making in a perfect information environment as a necessity for micro-economic theory. Imperfect decision making such as that investigated by Joseph Stiglitz underlines the importance of management of risk in the economy. New classical economics relied on the theory of rational expectations to reject Keynesian economics. Most well-known is the critique by Robert Lucas, who argues that rational expectations will defeat any monetary or fiscal policy. However, new Keynesians argue that this critique only works if the economy has a unique equilibrium at full employment. Price stickiness means that there are a variety of possible equilibria in the short run, so that rational expectations models do not produce any simple result. Some macroeconomists have returned to the IS–LM model and the Phillips curve as a first approximation of how an economy works. 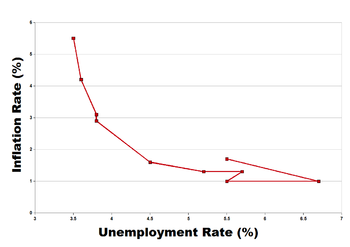 New versions of the Phillips curve, such as the triangle model, allow for stagflation since the curve can shift due to supply shocks or changes in built-in inflation. In the 1990s, the original ideas of "full employment" had been replaced by the NAIRU theory, sometimes called the "natural rate of unemployment". This theory pointed to the dangers of getting unemployment too low because accelerating inflation can result, but it is unclear exactly what the value of the NAIRU is—or whether it really exists or not. ^ "The Neoclassical-Keynesian Synthesis". The History of Economic Thought Website. The New School. Archived from the original on June 5, 2002. Retrieved April 23, 2009. ^ Woodford, Michael. Convergence in Macroeconomics: Elements of the New Synthesis. January 2008. http://www.columbia.edu/~mw2230/Convergence_AEJ.pdf. ^ Mankiw, N. Greg. The Macroeconomist as Scientist and Engineer. May 2006. p. 14–15. http://scholar.harvard.edu/files/mankiw/files/macroeconomist_as_scientist.pdf?m=1360042085. ^ Goodfriend, Marvin and King, Robert G. The New Neoclassical Synthesis and The Role of Monetary Policy. Federal Reserve Bank of Richmond. Working papers. June 1997. No. 98–5. http://www.richmondfed.org/publications/research/working_papers/1998/pdf/wp98-5.pdf. ^ Hayes, M.G. (2008). The Economics of Keynes: A new guide to the General Theory. Edward Elgar Publishing. pp. 2–3, 31. ISBN 978-1-84844-056-2. ^ Krugman, Paul. "There's something about macro". Retrieved January 2, 2008.